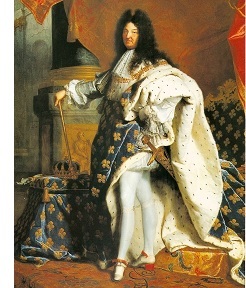 Louis XIV (1638-1715) - The Sun King; the most famous monarch of France (but not necessarily the Franks of which Charlemagne was king, and Napoleon who became emperor), and at 72 years, the longest reigning in Europe's history (of a major country, there were seven monarchs of minor principalities who ruled longer). Of course, technically he became king at the age of four, but did not take sole control of France until 1661 when Cardinal Mazarin (Richeileu's protégé) died. Like Charles I of England, Louis espoused rule by divine right which gave him the authority to consolidate power in France's central government. Under his tenure, the the last vestiges of feudalism were stamped out in France. At the time of his reign, France was the most powerful nation in Europe and Louis had designs on even greater power for his country. Yet, while he participated in several wars, France's borders hardly budged. Except for the War of Spanish Succession, none of the other conflicts under his reign are well-known. They were the War of Devolution, the Franco-Dutch War, the War of Reunions and the War of the League of Augsburg. His most lasting legacy is probably the construction of the famous Palace of Versailles, one of the most beautiful residences in the world, but a symbol of royal excess at the time of the French Revolution. In 1685, he revoked the Edict of Nantes, which had granted the Huguenots religious freedom within France. Although a staunch Catholic, Louis did not do it so much on religious grounds as political. He viewed Protestantism as weakening his royal authority and sought to unite the country under a single faith. For the next three decades the Huguenots were persecuted. But his persistent policy of centralizing government ultimately backfired as the tightening of power would lead to the French Revolution in the next century. When he died in 1715, his great-grandson succeeded him. Louis XV himself ruled for 58 years (that's two kings in one country for 130 years). Pictured at the right is the most famous portrait of Louis XIV by Hyacinthe Rigaud in which he poses with Charlemagne's sword Joyeuse.